Between 1896 and the early 1900s, a remarkable group of early Chevy Chase residents created a "Community of Readers" and through their passion for reading, they developed the first community associations and public institutions in the new suburb. In this exhibit, we explore the history of three early Chevy Chase groups associated with a love of books and literature. Drawing on historic photographs, documents and memoirs from the CCHS archive collections, plus historic newspapers and genealogical research, we have developed not only illustrated narratives about each group, but biographical sketches for many of the most active men and women. The exhibit pages provide a glimpse of the early days of the new suburb of Chevy Chase, and demonstrate that a love of reading itself helped create friendship networks, build a sense of community, and ultimately helped form the first truly public building, the Chevy Chase Library, as shown in the 1903 newspaper article below. The Washington Times, May 31, 1903, p1 of the Third Section. Click on the image to see the entire front page of this newspaper, which is available at Chronicling America: Historic American Newspapers, a digital newspaper collection created and hosted by the National Endowment for the Humanities and the Library of Congress. In 1903, The Washington Times published a full-page article, “Chevy Chase: Premier Among Washington Suburbs,” and right at the top was photograph of the new Chevy Chase Library and Post Office. The prominent placement of the photograph of the library and post office building suggested to newspaper readers that the library was a key element in the infrastructure of a new suburb. "The postoffice building is an attractive little structure of rough pebble-dashed mortar with stained timber finishings. Besides the mail offices it affords accommodations for the public library and fire apparatus. The library has a spacious, artistically decorated room, holding a collection of a thousand or more books. Capt. J. H. Pickell is librarian, and an active village library association attends to the selection and purchase of the best literary works. The library room is also used for giving various entertainments, card parties, and receptions; and lawn parties are often held on the grounds adjoining the building." The Washington Times, May 31, 1903, p1 of the Third Section. The original campaign for the construction of the Library was supported by the new residents of Chevy Chase, and they participated in fundraising efforts beginning in 1896. A few years later, in 1899, a group of four women began meeting weekly to discuss novels, plays, poetry and non-fiction; they called their group the Chevy Chase Reading Class. And in 1907, a Literary Club was founded, with both men and women meeting monthly to discuss literature of all sorts. The histories of these three organizations are based on local newspaper accounts and the minute books or ledgers kept for the Reading Class and the Literary Club. Below are short descriptions of each group; to learn more, click on the upper left menu to navigate directly to the detailed narratives. The Free Library Association was initially led by three young women: Edith and Janet Newlands, daughters of Senator Francis G. Newlands, and their friend Aloncita White, the eldest daughter of the Birney family. Beginning in 1896, the Free Library Association held meetings in private homes to raise funds for a library. Senator Newlands, president of the Chevy Chase Land Company, transferred ownership of a parcel of land along the western side of Connecticut Avenue between Kirke and Lenox Streets to the Chevy Chase Free Library Association in 1901, and the construction of a $5,000 building began. The original structure was expanded several times over the next century, and it is now the Chevy Chase Village Hall at 5906 Connecticut Avenue. In 1900, there were just a few homes in Chevy Chase – by 1910, according to US Census data, just 166 households. Many of the heads of these households were men employed by the federal government in various administrative positions. Their wives, along with a number of single women living in Chevy Chase, formed a reading class that met weekly from the fall through the spring months, beginning in 1899 and continuing at least through 1962. This was a serious reading class, with a carefully outlined annual program; many of the women had college educations and several had worked as teachers. Early on, the Reading Class members decided to “dispense with lunch” and thus focus on their reading and discussion more closely. Like many other study groups in this period, the members were also instrumental in raising funds for the library, and they participated in other voluntary organizations, such as the Young Women's Christian Association, the Florence Crittenton Mission, the Women's Club of Chevy Chase, and the Women’s Clinic in the District of Columbia. Chevy Chase women and men, both married and single, shared their love of reading as a form of learning and entertainment through the formation of a Literary Club. It was part of the Chevy Chase Association, a new organization that was the precursor of municipal government for Chevy Chase Village. The Literary Club met once a month in the evening, usually from October through May, at a member's home or at the Library. Many members had also been active in the Free Library Association and the Reading Class. Typical programs included the reading of original stories and papers, recitation of poetry, travelogues with lantern slides, debates on the issues of the day, and musical performances. The minutes of their meetings provide information about their reading tastes, but also about their professional life and interests. 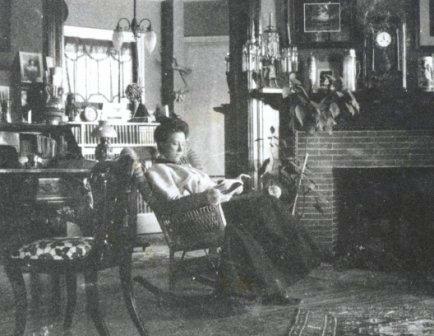 Helen Zimmerman Tucker, reading in her living room at 12 East Lenox Street, probably taken by her husband, Charles C. Tucker, circa 1900-1910. CCHS 1995.08.15. Read about the Chevy Chase Free Library Association. Or navigate through the exhibit by clicking on the links on upper left menu of each page.